While vacationing in Maine, I love the abundance of fresh seafood almost as much as the quaint harbors and friendly people. This summer salad was inspired by trips to Maine. 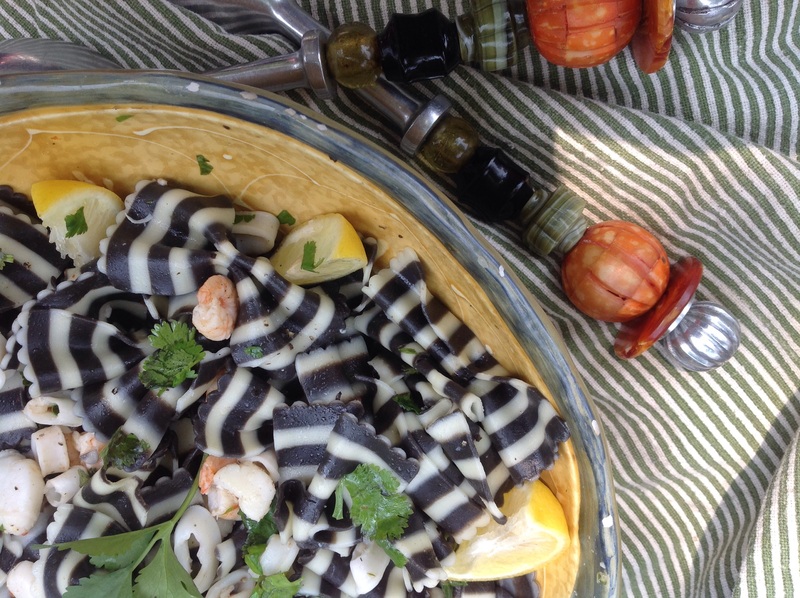 Pasta salads are a staple in summer cooking and this one is a fresh option with bright lime and cilantro overtones, dramatic squid ink bow ties and spicy sautéed seafood medley of shrimp, scallops and squid. 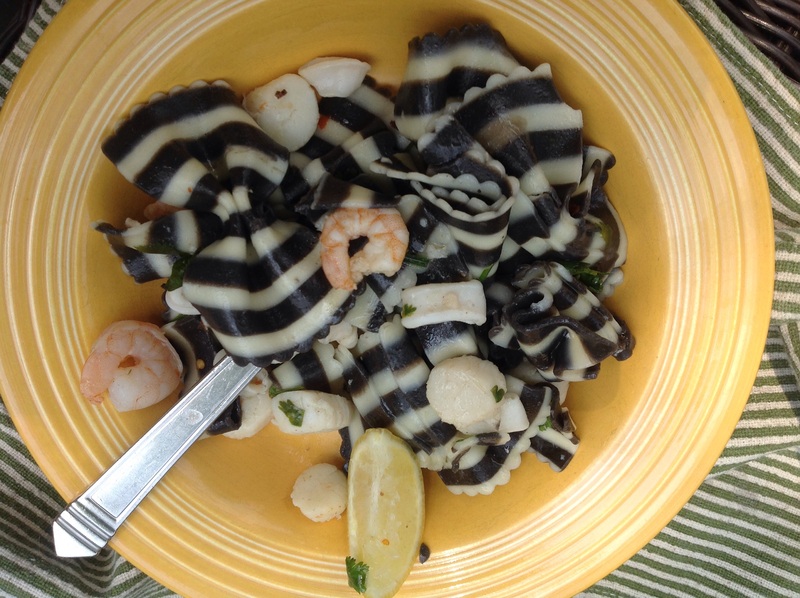 Squid ink pasta can be found online at Amazon.com or in specialty food shops. Fresh summer flavor comes from the addition of big handfuls of herbs, plucked right from the garden. The salad is versatile and can be composed with your favorite seafood and the herbs on hand. Enjoy! Cook pasta according to manufacturer’s directions. Sauté the seafood in 2 T of the oil in a medium pan. Add the garlic and hot pepper flakes. Cook until seafood just loses its translucency. In your serving bowl, squeeze the juice of the limes. Add the herbs and whisk in the remaining oil to emulsify. Add the pasta, then the seafood and toss together to coat. Salt and pepper to taste. Serve with extra lemon or lime wedges. Can be eaten at room temperature. 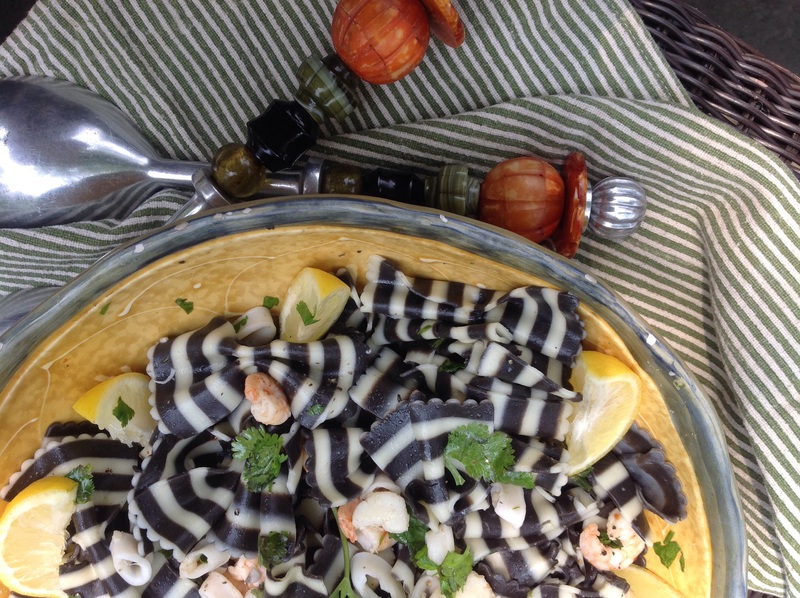 This entry was posted in Recipes and tagged Seafood lunch salad, seafood summer salad, Squid ink bowtie pasta salad by Johanne Lamarche. Bookmark the permalink. I think Maine might be a bit like Denmark in the summer. Love that cooler weather and that gray blue light and all the wonderful seafood. Wish I was waking in Maine this morning, but alas, back In hot humid Pennsylvania. Thanks for visiting Naina! 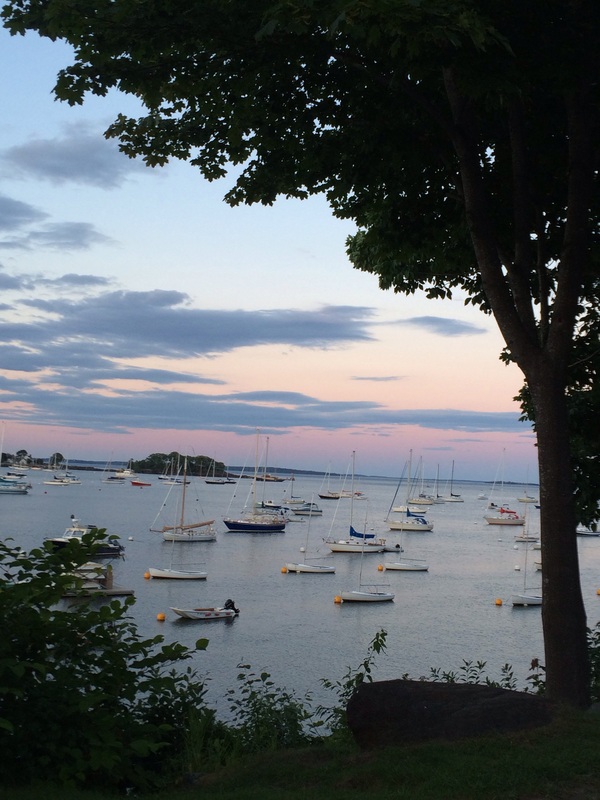 I just love Maine and go seafood crazy when we are there! Your pictures are amazing and have me wishing I was there and eating your amazing dish. 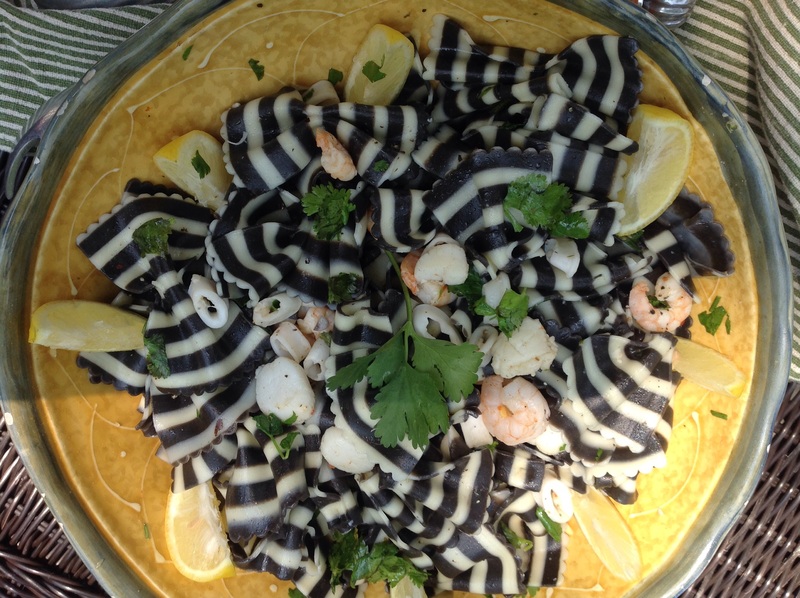 I first had squid pasta in Venice Italy. Your dish sure brought back some wonderful memories! Glad I brought back so many good memories Julie! 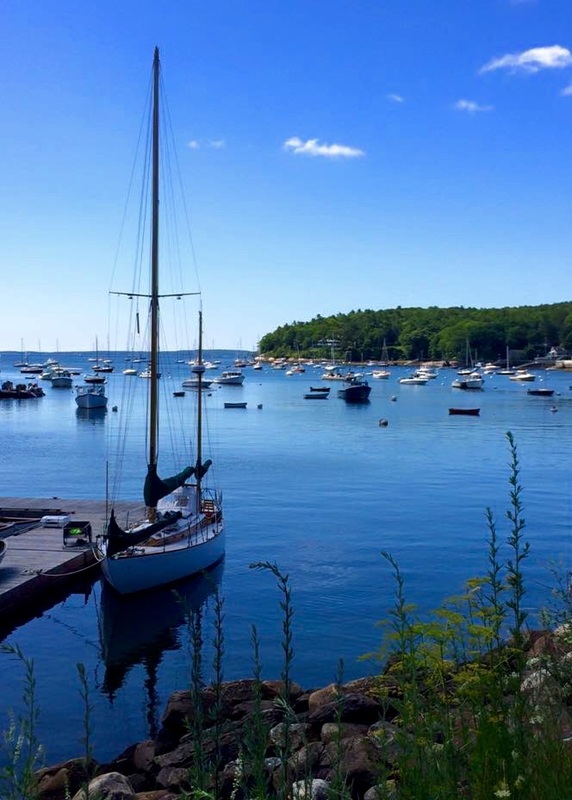 Venice and Maine, two of my favorite places in the world! Wow, not sure I’ve tried that type of pasta before, but it sure looks good. Love any type of seafood and I’m sure this was mighty fine! Love Maine too, I dream of lobsters whenever I think of Maine. Gorgeous sunset. All my favorite spots in TO! I lived in the Annex and my practice was at Spadina and Bloor. I could walk to queen St W! There was recently a garden bloggers’ conference on the Toronto Islands with a parden tour I had never heard of. If you want to read about it, look up Empress of Dirt Blog and she has a link to it and a tour documented. I love the Highline gardens. So ingenious! I used to receive your blog by email. It might be in reader which I don’t go through as much.